If you’re looking for the best DNA 200 box mod, there are tons of great options out there, although the DNA 200 chip has been superseded by the DNA 250 chip. So what are the best devices if you’re looking for a great DNA mod? Here are 7 of the best DNA 200 box mods on the market. Menthol is one of the e-juice flavors smokers are most likely to gravitate towards, and so finding the best menthol e-juice is often an important step towards quitting smoking. There are plenty of great options around for smokers, but if you’re looking for a menthol liquid you’ll keep coming back to, here are our top 10 choices. Getting the best cheap vape pen helps you make the switch to vaping without spending too much to get started. Whether you’re looking for something to vape e-liquid with, a concentrate vaping device or something for dry herb, there are tons of great affordable vape pens on the market. Here are some of our top picks in each category. If you’re looking for the highest-quality dry herb vaping experience, the unfortunate truth is that something affordable and portable probably isn’t the best way to go. The good news is that there are tons of great options when it comes to desktop vape devices, and here are 10 of the best. Are you looking for the best portable vaporizer on the market? Whether you’re after a vape pen that does a great job with concentrates or a full-featured handheld vaporizer to use with dry herb, there are tons of excellent devices that can help you wave goodbye to combustion. If you’re in the market for a wax vape pen, how do you make sure you get the best device? How much should you spend on a dab vape pen? What should you look out for when you’re making your choice? And which are the best wax vape pens on the market? This post tells you everything you need to know. Although having one or two stand-out flavors is definitely a good thing, considering how good e-juice vendors overall offerings are is very useful when you’re thinking about placing an order. So we conducted a poll to find out the best e-juice vendors for 2015, and here are the top 20 vendors as voted by you. In this age of sub-ohm tanks, 150 W mods and cloud competitions, vape batteries need to be capable of putting out some serious power. To help you find the best battery for your needs, we’ve put together a new 2015 list of the best high drain batteries for sub-ohm vaping. For a smoker first making the switch to vaping, or for a vaper who wants to keep things as simple as possible, finding the best vape pen on the market is a big priority. So here’s our list of the best vape pens currently on the market, from the basic options to the modern, sub-ohm capable beasts that push the category to breaking point. As you get accustomed to vaping, spending a little more to get a high end vape mod starts to seem more and more worthwhile. While cheaper mods will have their little flaws, won’t be made from the highest-quality materials and ultimately may be a little unreliable, high-end mods put quality and dependability above all else. But what are the best high end vape mods on the market? Authentic mechanical mods are works of art, and they’re often priced accordingly: with it often costing well over $100 to pick one up. But what about if you want the hard-hitting performance of a mechanical mod without breaking the bank? 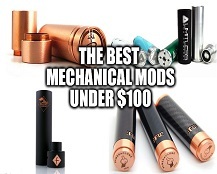 Here are the best mechanical mods for under $100, based on our poll of vapers. As the name suggests, “all day vape” (or ADV) e-liquids are the juices you can keep going with throughout the day and still enjoy right up to the last puff before you go to bed. The problem is that finding a juice you like that much isn’t exactly easy. So what are the best all day vape e-liquids on the market? We’ve polled thousands of vapers and combed through hundreds of user reviews to find out. We polled thousands of vapers about their favorite VV/VW e-cigs and their favorite starter kits, and we’ve used the results of those polls to put together this top 10 list of the best internal battery mods on the market for 2017.